I'm thinking I'm the luckiest guy on the planet. My other half and I were watching some current action flick (probably the Avenger series) - when there was one particular scene where there was a bad buy wearing a very thick, military looking trench coat - but made of thick shiny rubber. After the film - my other half admitted how much she liked it - and how she'd love it to add to our playroom collection for me to wear whilst we... well you get the idea. Closest theme I could find on an image search is below. But the one we're after was a lot darker - and military looking (happy to have military labels). So after advice on where to buy such a deliciously fetish flavoured item? Keep looking on eBay - and can see SBR Coats - but not found anything close. Aware it will cost - but after quality over price. Any ideas? Try going to Weathervain. Not cheap but you will get what you want. And the coat will look a little dull but the best polishing for SBR is a silicone oil ( Halfords/motoring shop) or Mr. Sheen furniture polish which contains silicone. They don't make them like that anymore but there are still some around from the time when they did make them. That is of course, one helluva SBR (we all know what SBR means dont we? Not "Shiny Black Rubber" although I suppose it could, if you wanted it to. You mentioned "I'm thinking I'm the luckiest guy on the planet. My other half ..." and all I can say is that I could also be the luckiest guy alive on the planet but she isn't my other half nor am I hers, but among the plethera of common interests we discovered, during covert meetings was that she always liked the feel of silk against her skin, from early years but the one day, I tentatively clad us both (second date) in latex (hydrogloves) and she realised that silk was just a portent for the "real thing". We do like skin on skin of course, but the added strands of rubber and latex . . . . Yes, we should cut to the chase and make each other the other ½, except thereby, others, innocent, unaware of the power of latex and rubber, could not possibly understand. So we "do it" once or twice a year, and in between we talk about SBR raincoats, MacMacs (she wants to see mine, unaware they existed till she met me). Sorry to blab on, but it is nice isn't it? And yes, listen very carefully because I shall say it only once: Women love the feel of rubber and latex against their skin and the sensual, sexual provocation therefrom, just as much as men. They are just much more subtle. But let me say: Find her! Build your life around her! 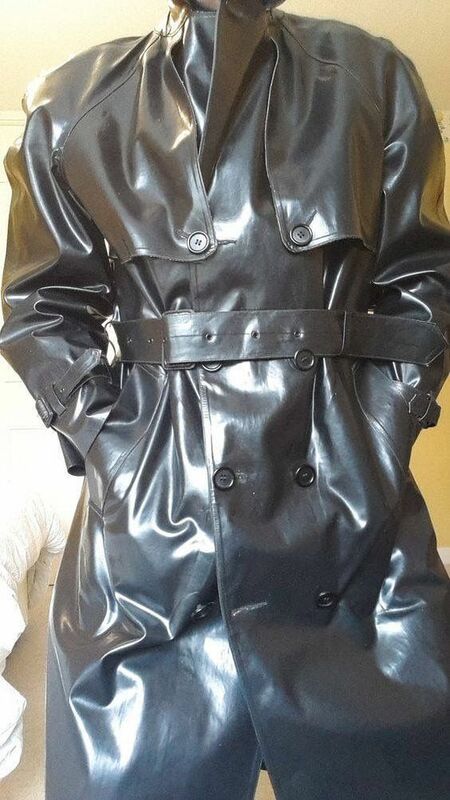 If you want one in latex, then Ectomorph do one. Have you seen the gorgeous one on Selawear site. Lovely SBR with hood and very large mouth and face cover. Get worked up every time I look at it. Yes the male version of the Sealwear military coat looks excellent. Hi Spitfire. Only just seen your message. The one I was referring to was in fact theeir 'Bizarre mackintosh with hood and face covering . really gets me going when I look at it. I cannot say I have seen that one?